One of the most visited local history museums in the state, old and new have been successfully joined together to display the rich history of the area now known as Los Altos and Los Altos Hills. Centrally located between the main library and Hillview Community Center are the J. Gilbert Smith History House, built in 1905 and a museum since 1977, and the Los Altos History Museum, which opened in 2001. Family-friendly Permanent Exhibits with hands-on activities abound: in the main museum, enjoy the interactive exhibit, Crown of the Peninsula, depicting the uses of local land and its inhabitants over time--Ohlone, Spanish & Mexican land grantees, early settlers, apricot growers, and today’s Silicon Valley residents are all depicted. One highlight is the replica of downtown Los Altos as it looked in 1932, with an actual working model railroad. It delights children of all ages. The Craftsman-style Smith House is a fully-furnished farmhouse depicting life during the Depression, surrounded by heritage oaks, gorgeous gardens, and a working heritage apricot orchard. It reminds us of a time when our main contact with the rest of the world was a single telephone in the hall and a radio in the living room for news and entertainment. Outdoors, learn about our agricultural past with a historic tank house with its farmhand’s humble home, apricot cutting and sulfuring sheds, 3-hole outhouse and lots of farm equipment, including a tractor to climb on. The Museum’s Changing Exhibits Gallery features two to four original exhibits a year on diverse topics. Social issues and land use are covered in detail, as are the lives of local residents. Through April 17, we explore how we remember our ancestors in Spirits Return: Cultural Traditions Keeping Memories Alive. Upcoming exhibits include oral histories from the Museum collection, the Murphy-Taaffe family saga (the first wagon train to come to California, two years before the infamous Donner Party) and the story of Juana Briones. As part of its mission, the Los Altos History Museum presents Educational Programs associated with its exhibits, the Margaret Thompson Historical Essay Contest for 3rd-6th graders, third and fourth grade history curriculum tours, and the traveling Ohlone kit for schools. Research and image requests are handled by phone, email or appointment. The oak-studded gardens with their mature floral landscaping and brick patio offer the perfect venue for wedding ceremonies and receptions, luncheons, reunions or other social gatherings. Both the Museum and gardens are available for event rentals. The Museum’s store offers many unique items for sale, including cards, toys, books, jewelry, unique gifts and one-of-a-kind items, often reflecting the current exhibit. As a community museum, the Los Altos History Museum welcomes new members and volunteers! Benefits of a tax-deductible membership include free admission or discounts to the events, lectures and programs; a 10% discount at the Museum Store; a subscription to the quarterly newsletter; and advance notification of popular events like the Crab Feed and other activities. The Los Altos History Museum is located at 51 So. San Antonio Road. Admission is free. Hours are noon to 4:00 p.m., Thursday through Sunday. Docents are available during regular hours and special tours for groups of ten or more may be scheduled with advance notice. For more information on the Los Altos History Museum and J. Gilbert Smith House, its changing exhibits, special events, collection research, membership and its many volunteer opportunities, please check our website at www.losaltoshistory.org or call 650/948-9427 x14. 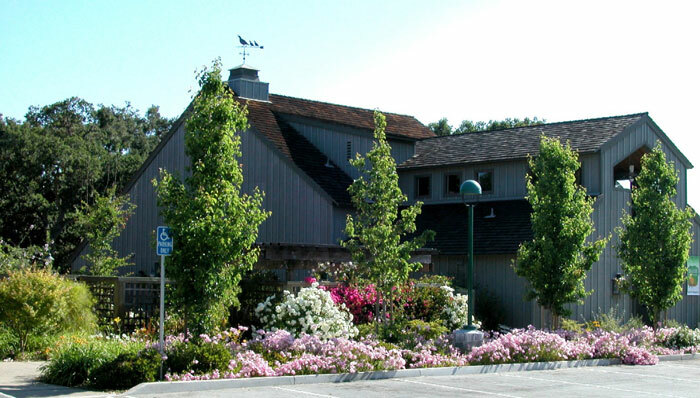 The Museum is operated in a partnership between the Association of the Los Altos Historical Museum [a 501(c)(3) nonprofit organization] and the City of Los Altos. In 1954, on advice from architect Frank Lloyd Wright, the newly-incorporated City purchased the J. Gilbert Smith property as a site for the Civic Center, with the Smiths retaining lifetime residency of the house and a surrounding acre. Upon Mrs. Smith’s death at age 96 in 1973, the house and remaining acre was given to the city to be used for historical purposes. In 1974, the Los Altos City Council created a Historical Commission to plan the transformation of the Smith home into a museum to preserve the history of the Los Altos area. “History House” opened on December 1, 1977 (the 25th anniversary of the City’s incorporation), was designated a local Historical Landmark in 1981, and a California State Point of Historical Interest in 1987. Gilbert Smith’s apricot orchard (the first Heritage Orchard in the valley) continues to thrive among the buildings on the Civic Center site. The new building opened in 2001, built entirely with private donations. In May 2002, ownership was transferred to the City of Los Altos. The Association manages and staffs the Museum, Smith House, and grounds for community benefit.